Our Best Answer - What is the Bronco Student Center (BSC)? Operated by Associated Students, Inc. (ASI), the Bronco Student Center (BSC) is the social hub for diverse programs and services that bring together students, faculty, staff and guests of the University. The BSC (Bldg. 35) is centrally located just west of the University Bookstore and east of the University Library. Eat at the Food Court where you will find a variety of options, including Freshens & Peet's Coffee, Subway, Qdoba, Round Table Pizza, Poly Fresh and Hibachi-San. Meet with a small group of friends or with a large crowd in one of the many rooms available for students to reserve. Check out the ASI sponsored mini-concerts, film showing or viewing parties for our Athletic teams. Study in Solaris Lounge or one of our study rooms, equipped with tables, chairs, and couches. Head over to the Games Room Etc. and enjoy games such as pool, video games and bowling. Purchase discounted tickets to various Amusement Parks, movie theatres and other locations at the Box Office located inside the Games Room Etc. The Box Office can be reached at 909-869-4467. 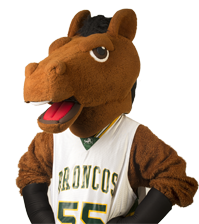 For a map of the BSC and additional information, go to the Bronco Student Center web page. What is the Poly Trolley?